Sporting Kansas City has endured a tortuously long road stretch in anticipation of their home opener. Livestrong Sporting Park opened up to a sold out crowd of 19, 925 as Sporting Kansas City took on the Chicago Fire. These fans enjoyed a first class facility, the best in the country most likely, to watch a soccer game. The game itself however, left something to be desired. It was not without its drama, but it was without goals. 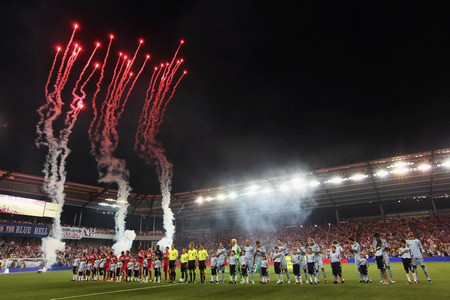 The game ended in a 0-0 draw despite Sporting KC going down to ten men with twenty minutes remaining in the game. Both teams remain winless in 10 games. Despite the scoreline, the game opened with excitement and celebration. Lance Armstrong spoke before the match and Chad Ochocinco was on hand to rally the Sporting locker room. Kansas City has the better of the chances in the early parts of the game, forcing the Fire into havoc defending and ballistic tackles. Despite this though, the Sporting attack lacked Cohesion throughout. Repeatedly Sporting employed the long ball to Omar Bravo, a player who has never allowed his game to be so one dimensional. Bravo was clearly frustrated with the tactic as it consistently proved ineffective. Sporting went down to ten men in the 67th minute after Jimmy Nielsen handed the ball outside the box while also denying a clear goal scoring opportunity. The moment Nielsen made the play, it was evident he knew his wrong doing and he rested his head in his hands before walking off. Despite being a man up, the Fire could not put the ball in the back of the net. In fact the best opportunity for a goal to be scored came from a no-called tackle on Omar Bravo. Bravo was inside the Fire’s box and about to make an attempt on goal when he was absolutely leveled by Bratislav Ristic with a sliding challenge. The replay showed the tackle to be a clear foul despite making contact with the ball. The nearly twenty thousand fans screamed for a call but referee Michael Kennedy had no part of it. It was rather remarkable considering the season’s brutal tackles resulting in injuries. Bright spots on the night included Daniel Paladini and Corben Bone for the Fire. Both players were active and threatening, however they were clearly without the support needed. For Sporting, Michael Harrington played especially well. The game may have left something to be desired, but the stadium is beautiful. Sporting Kansas City fans are lucky to have it. Perhaps with the team no longer traveling their fortunes will improve.